Disclaimers are created to of course protect the purveyor of the information you are reading,. and not to take responsibility for what they write. Its a little different here at ProfitPal1.com. The information here is intended to help you to better understand the Profit Pal Mobile invoicing App. No ulterior motives here. Having said that,and times being what they are, please take the time to read this brief disclaimer. This disclaimer serves to inform the readers of this site that information is provided to you as a public service. In know way should the provider of this site be responsible for use of the information provided here. It is believed to be accurate and timely, but it is still the readers responsibility to check it out for themselves. By reading the content on this site you assume responsibility for any actions you take as a consequence of reading the site. You also agree to hold harmless the admin of the wesite for any and all decisions you make as a result of reading the materials on the site. These are the terms of this disclaimer by staying on this site you agree with them. If you agree with them, then you may continue to enjoy the information on this site. 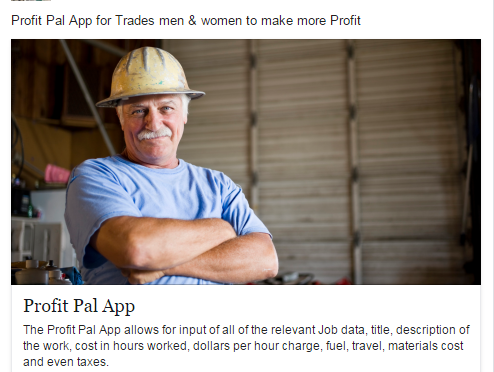 We hope you enjoy the site and use it as a resource to help you better understand what the Profit Pal App is all about. Your privacy is very important to us. So rest assured no cookies or other nafarious methods are used here at the ProfitPal1.com website. And we do not share any information with antone else. So feel free to enjoy all of the informational articles on the site. They are here to help users of the app to become familiar with its' use.